Gyminee.com is the exercise and nutrition website I've been waiting for for years. Finally, a free easy to operate food tracking application that is smart and functional. 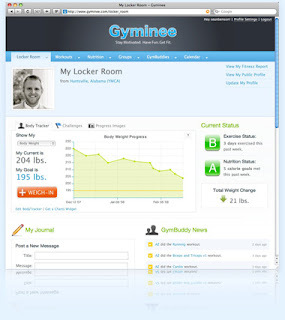 Gyminee is based on the oh-so-popular social networking model complete with personal profile and photo. You can have gymbuddies and join motivational groups. Sign up for a free gyminee.com and you can track your daily food intake and have it automatically generated into easy to read pie charts that allow you to translate your calories into carbs, fat, and protein. In the workout area you can create exactly the workout you do now and track them. You can also search other peoples workouts to do yourself. These workouts are genius because most exercises actually have not only a description of how to do the exercise but a handy video demostration. Print your workout out and take it with you to the gym. Gyminee also allows you to set goals for specfic exercises and track them on beautiful easy to read charts. The charts are my favorite part of the site. You can track your weight-loss or muscle gain through weigh-ins or by measuring specific body parts like waist, hips, and thighs. I love just about everything about it right down to being able to track my nutrition on the go with the use of the iphone application. I've read zillions of magazine and web articles over the years and know from personal experience that fad diets don't work as well as simply keeping track and being accountable for what you are eating. I can only speak for myself, but when I know I have to log it later I am less likely to even look at the donnuts that a co-worker has brought into the office. Thank you for blogging about Gyminee. My name is Derek and I work with Gyminee and we appreciate genuine press like this. Please let me know if you have any questions about the service. We are going to be rolling out a new feature very soon called Gyminee Challenges which will let members create or join a fitness or diet challenge with friends or co-workers. We see this as a fun way for people to get motivated about staying in shape. Keep a look out for it!